The Latin poet Catullus (born in Verona 84 bc), who died roughly at the age of thirty, was the first poet in the ancient world to write about a personal love affair in an extended way. 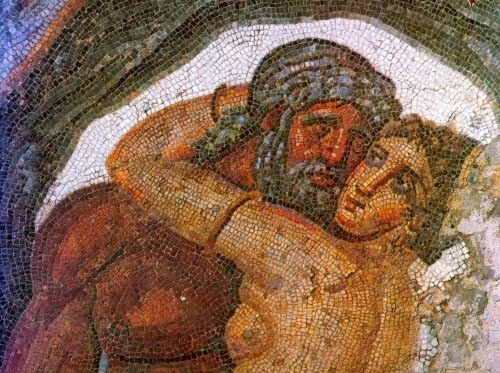 Other poets treated the subject of “love,” allowing the flushed cheeks or alabaster limbs of this or that woman to enter the frame of their poems, but it was Catullus who wrote verses with a near-obsessional passion around a single woman whose entire presence, body and mind, fills the lines of his poetry. From the first excruciating moments of infatuation with the woman he called “Lesbia,” through the torrid transports of physical love, to the betrayals that leave him stricken, Catullus told it all, and, in so doing, did more than anyone to create the form we recognize today as the love story. one unending night that's left to sleep through. knowing the final sum of all our kisses. This is poet's call to Lesbia to join with the poet in living and loving to the fullest. The poem begins by the poet pleading to Lesbia not to pay any attention to old men's morals and strictures . The poet adopts the pose of the lover whose passion makes him (and his love) vulnerable to external but intrusive forces that seek somehow to negate his passion. He, therefore, suggests to spend their moments of togetherness with maximum pleasure and contentment. There is an ecstatic frenzy in the piling up of kisses and he provides brevity of life as a rational for his overindulgence in passion. I liked the poet's idea of confusing the number of kisses, making it numberless, to avoid hex ( bad eye or curse), as envy comes only when there is clarity in the number of kisses. It was also believed in ancient time that precise knowledge had special powers: knowing the exact number of kisses exchanged by the lovers would enable malevolent outsiders to cast a spell on them. Excellent poem. Loved the poet's indulgence. But baffled why he chose the name Lesbia for his beloved as that immediately associates with Lesbianism. Perhaps, Lesbianism was unheard of in the poet's times.